Near our cosy B and B in Burgundy, from 22 to 25 August 2019 musical encounters of Vezelay are devoted to vocal art. In the magical setting of the basilica several major works of the classical repertoire are interpreted. Feel free to visit the eternal hill and let you be lulled by the beautiful voice. The Rencontres Musicales de Vézelay is a festival dedicated to the vocal arts which takes place every year at the end of August. Four days and 28 concerts of vocal music unlike other festivals. Outstanding programming which brings together some of the best European ensembles to perform sacred music. 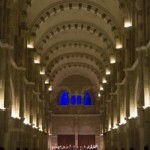 In the magical setting of the Basilica, musical activities for the whole family in a simple and convivial atmosphere. You are invited to participate in the festivities on the “eternal hill” of Vézelay. In the afternoon, the concerts take place in churches in neighbouring villages In the evening the concerts are held in the Saint Marie-Madeleine Basilica of Vézelay. Concerts feature major works from the classical repertoire as well as forgotten. Sometimes unknown or rarely performed pieces which are equally as wonderful. The repertoire covers six centuries of music, from the Renaissance to the present day, including Baroque, Classical and Romantic periods. The Rencontres Musicales de Vézelay also proposes informal and friendly musical moments in the village’s enchanting medieval streets. There are three free concerts (vocal jazz, world music, humorous music etc.) and six informative musicological presentations. It is as well as an opportunity to taste the local wines of Vézelay directly from the producers. In addition there are vocal workshops for children. A choral conducting workshop for conducting students at the end of their studies. The festival’s attendance has been steadily growing and the Rencontres now welcomes over 6000 music lovers from all over Europe to its concerts. Thank you for checking availability of our cosy B and B for your accommodation.